Per Scott's request, here are some pics from Aidan's big day. 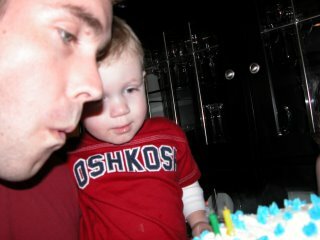 You get to see him blowing out the candles with his daddy, which was actually quite funny. Aidan only blew out one candle, and then the smoke from that candle wafted back into his face. This was something that Aidan did not like, and almost made him cry. Then Macon bravely stepped forth to help vanqish the fire from the second candle and the smoke from the first. When it was all said and done, Aidan was happy and glad to eat cake with ice cream. This cake was a red velvet concoction which I baked in a bundt pan. I don't know how many of you have ever tried to decorate a bundt cake, but I found that this can be particularly difficult. I need to invest in some normal cake pans...Anyways, after scraping off my first two attempts, we ended up with a red velvet bundt cake covered in cream cheese frosting with little blue dots all over. It looked like a gigantic donut with blue sprinkles! 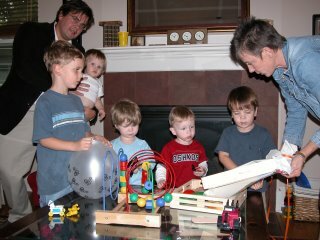 Moving on--in the second photo you can see many of the cousins and a neighbor gathering around as Sue Sue helps to open a new present. 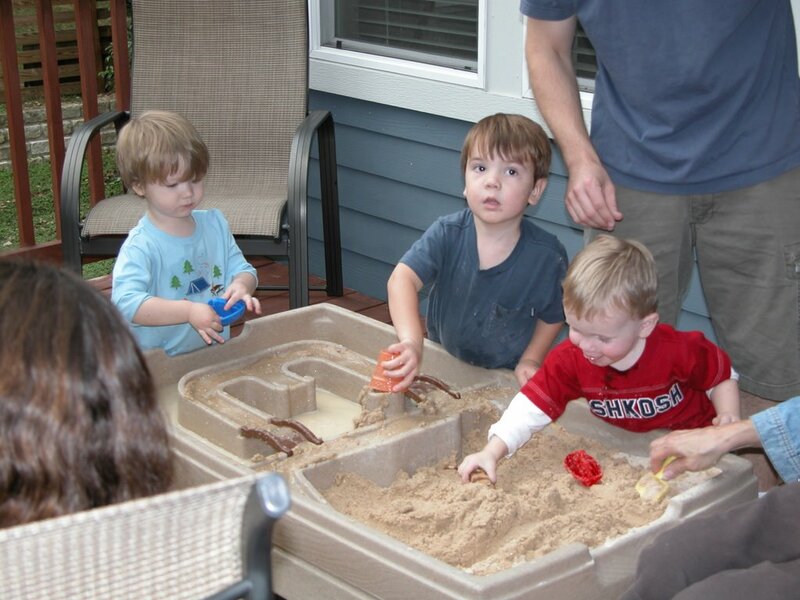 And, last but not least, the final pic is of Aidan (and others) enjoying his new sand and water table. Can I get a "woo-hoo"?